Of the many difficult aspects of coping with divorce (or the ending of a long-term relationship) are the places that the two of you went that were very special. Restaurants, bars, coffee houses, breakfast places, parks, museums, even vacation spots can be places that when your marriage is over are brutal to even think about walking into. One of my favorite Italian restaurants was a place I went to with an ex many, many times. We always requested a certain server, we knew the menu almost by heart, and most importantly, I can’t remember ever going there and not having a nice time. So, when we broke up, going to the place didn’t seem like an option for me. Why would I want to go to a place that had so many memories that now seem bittersweet? Then, time went by. I started to think about how great the restaurant was. Delicious food, great ambiance, nice people…and I thought, ‘OK, so this was “Our place.” Why can’t it now become “My place?” I knew that if I ever wanted to go there again, I’d have to start by actually going there. So, I went there last weekend. I went there on a date. I found myself a little nervous walking in because I wasn’t sure how I would feel. Would I get upset? Would I get teary eyed? Would the memories of my past relationship cause my night to be ruined? I have to say, it was nothing like I expected. I drank, ate, said hello to the people I knew, and that was it. I then enjoyed martinis, salad, pasta and scallops and it was just as yummy as I always remembered. 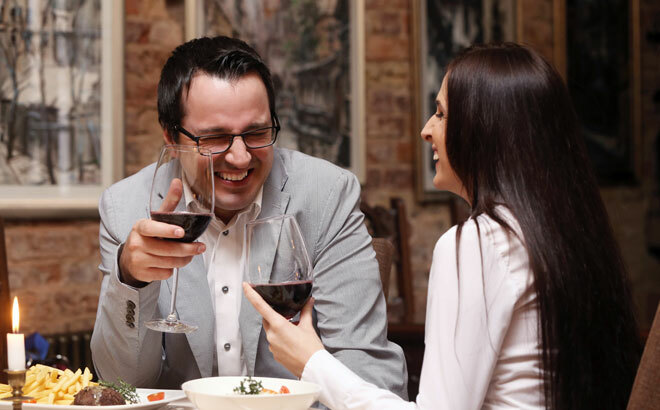 And, the date was very fun and romantic, almost seeming as if the place had never been “our place,” but rather that I was on a date at a new place. I now feel like I can go there as much as I want and think nothing of it. It’s liberating. Empowering. And it just feels like I’m at peace because the anxiety of it is gone. I think the timing has to be right. If you go to “our place” a month after your husband (or wife) tells you they are leaving you, you might have a different reaction than if you wait until you have had enough time to heal. Incidentally, I also recently ate at a restaurant in the city (with the same date-a total cutie, by the way) where I used to go a lot with my ex-husband, and honestly, it was fantastic. I actually had really great memories of being young and kid-less and living in the city. I didn’t feel sad or bitter, although I have to admit, I did feel really really old. But my point is, I had positive memories of my ex and I eating there. Additionally, I will now have these really great memories of eating there with my new guy. The thing about “Our place” is, when you’re actually there, try to remember the good times, not how or why your marriage ended. If you do that, the place will only offer you happy memories and a bright future of going there. Oh, and make sure you go to the place with someone really special or a group of people that really mean a lot to you. In other words, don’t take clients there for a business lunch. In closing, one thing I’ve learned as I’ve gotten older: memories are so important in life. And it’s OK if certain memories end up bittersweet, because they actually happened and they are part of who you are today. But, it’s the new memories you are making that are most important. They are the ones that will shape your future.